Two tries to powerhouse winger Julian Savea propelled the All Blacks to a convincing 28-9 win over Argentina at a rain-soaked McLean Park in Napier on Saturday. Savea crossed in each half as the hosts scored four tries to make light of a poor kicking display by first five-eighth Beauden Barrett in the Rugby Championship Test. Barrett, making his first start in the No.10 jersey, landed only one of his five attempts at goal but laid on two tries and had a hand in a third to more than balance the ledger. The wet conditions made handling difficult and both sides were guilty of a host of errors in a largely uninspiring first half played in steady drizzle. Coach Steve Hansen said Barrett would only benefit from the outing in tricky conditions. "It was a great for him. He's going to learn a lot from it," said Hansen. He also said he was very happy with the final result, especially securing a bonus point. "I was very pleased with the intent and purpose of the side. Yes we made a few mistakes, but we made them trying to do things and trying play positive rugby." Argentina captain Agustin Creevy said he rued his side's inability to make the most of their few opportunities. "We didn't take advantage of our chances to score and that was the difference," he said. Both teams traded penalties before Savea continued his stunning try-scoring record. The left wing crossed for his 25th try in as many Tests after two grubber kicks helped breach the visitors' defence after a counter-attack sparked by local hero Israel Dagg. Barrett stabbed through the first which was athletically regathered by lock Brodie Retallick before Conrad Smith put in the telling kick for Savea to score. Dagg, recalled to fullback after missing the last four All Blacks' Tests, was cheered loudly by the capacity 21,329 crowd every time he touched the ball in just the second Test match played in Napier. But he couldn't do much to prevent the match meandering as it approached the interval forcing the crowd to amuse themselves with a Mexican wave as mistakes and reset scrums left them frustrated. The All Blacks resorted to up-and-unders to get them on the front foot as poor handling and a swarming Pumas defence limited their opportunities. A rare scrum tighthead by the All Blacks allowed Barrett to scythe through the Pumas' defence and send Liam Messam away for his sixth Test try and a 13-6 lead as the half-time siren sounded. Savea's second try from a set move off a lineout minutes after the resumption as the rain finally abated was laid on by Barrett whose pass sent him over for his seventh try in five games against the Pumas. Half-back Aaron Smith added the bonus-point try late on to go in under the posts and despite a seemingly fair try to No.8 Leonardo Senatore, the Pumas offered little in the way of an attacking threat. Their scrum, however, did pose problems for the hosts but they failed to make the most of the few chances they had. Lock Sam Whitelock left the field with what appeared to be a rib injury in the first half while Messam also limped off early in the second half. 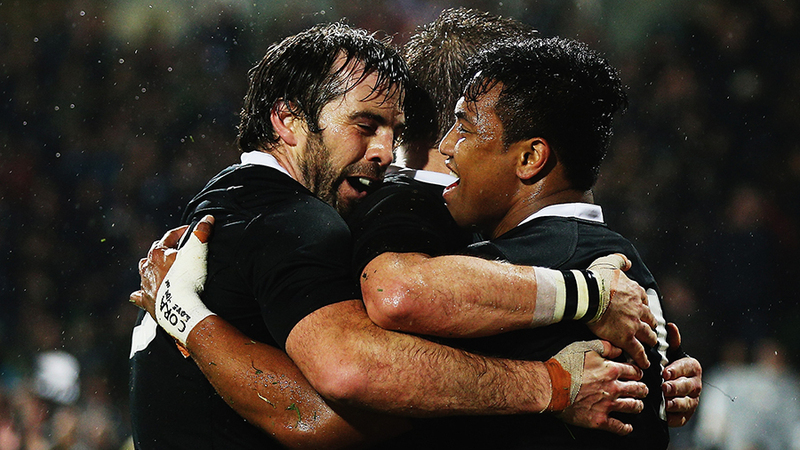 Both will face a race against time to be fit for the All Blacks' Test against South Africa in Wellington on Saturday. All Blacks captain Richie McCaw said he was happy with the side's result but he accepted they had been scrappy. "You score four tries in conditions like this you've always got to be happy. It was always going to be a bit scrappy … we didn't look after the ball as good as we could have but we stuck at it," McCaw said after the match. "For the most part [New Zealand's set-piece] went alright. There was a wee patch in the second half where we didn't get much luck at scrum time, but towards the end there were a couple of big scrums that resulted in tries, which was pleasing."